The Kenwood R-11 is a beautifully built eleven band world band radio. The bands are selected electronically with soft-touch buttons. The selected band is indicated by red LEDs. 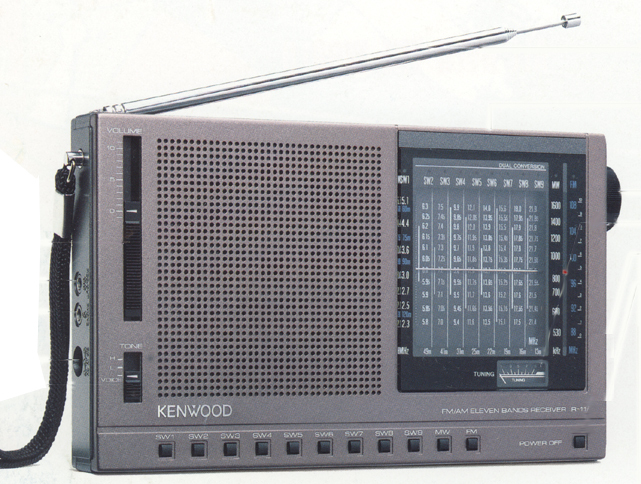 Enjoy nine bands of shortwave wave coverage: 2.3-5.1, 5.8-6.3, 7-7.5, 9.4-9.9, 11.6-12.1, 13.5-14, 15.1-15.6, 17.5-18 and 21.4-21.9 MHz. 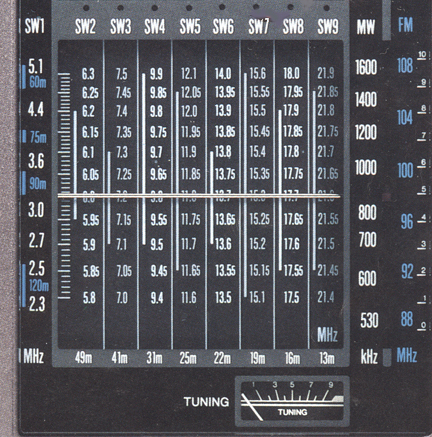 There is a three-way Tone selection switch and analog tuning meter. The left panel features earphone and line output 3.5mm jacks as well as 6 VDC input jack. The 3 inch speaker provides nice fidelity. The double conversion circuit provides good shortwave performance. NOTE: This model was also sold as the Toshiba RF-P11. Copyright 2016-2017, Universal Radio, Inc.